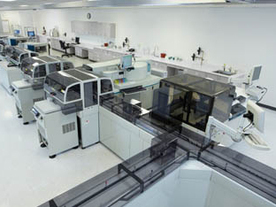 In a significant boost to availability of in-vitro diagnostic testing services in India, the Diagnostics Division of Siemens Healthcare has successfully installed the worlds longest lab automation track at Thyrocare Technologies, Mumbai. The Siemens Aptio Automation installation at Thyrocare is also Indias first lab automation solution. The installation at Thyrocare is 93.5 meter long, which is currently the longest in the world. It has 31 instruments (24 Advia Centaur XP Immunoassay systems and 7 Advia 2400 Chemistry systems) docked to the track, 10 rack loading / unloading robots and 5 decappers. Various intelligent features in the solution allow Thyrocare Technologies to perform approximately 200,000 tests per day involving both immunoassay and chemistry. Aptio is an adaptable solution that allows for a phased implementation to accommodate both current and future needs of medium- to very high-volume laboratories. The solution promises to transform laboratory operations by combining Siemens industry-leading workflow expertise with peak performance, adaptability and intelligent technology. Aptio Automations circular track and modular design ensure adaptability to nearly any lab or testing environment. Aptio Automation also offers connectivity to Siemens portfolio of automation-ready analyzers, thus facilitating a multidisciplinary approach to testing. Further, the point-in-space aspiration feature helps streamline workflow by reducing the need to aliquot (or divide) samples and its puck-based system with RFID enables individual sample routing and tracking, along with STAT prioritization. Additionally, Aptio Automation delivers comprehensive analytics via powerful, centralized information technology, while having the flexibility to provide pre- and post-analytical capabilities. Siemens CentraLink Data Management System facilitates efficient sample flow, auto-verification, quick access to samples and proactive quality control (QC). Plus, the CentraLink System can be customized per end user, speeding up system access and supporting error reduction.